Try our Genuine Quartz Crystal Jewelry Satisfaction Guarantee - compare our prices and our superior quality. 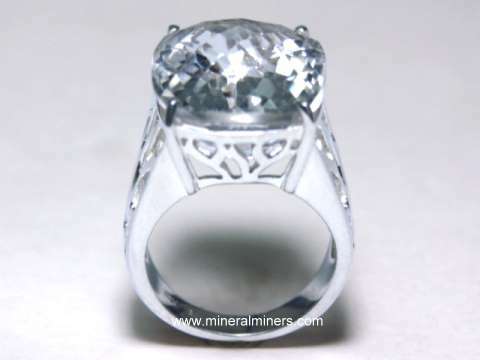 Select any genuine rock crystal quartz jewelry image below to enlarge it. 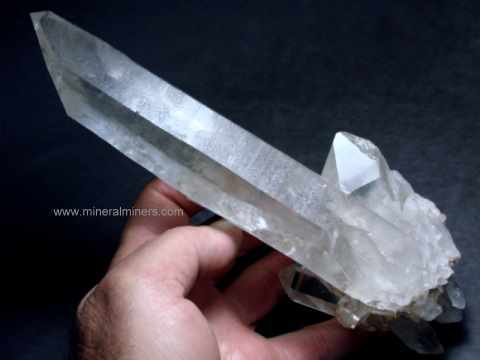 GIANT 364 carat Quartz Crystal Bracelet!! 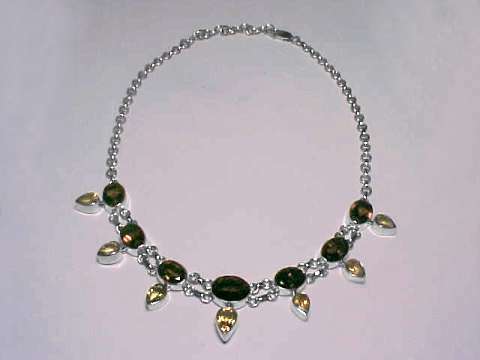 Set with 364 carats of faceted natural quartz crystal gemstones! This amazing quartz crystal bracelet was handcrafted in 925 sterling silver and set with very large natural colorless quartz crystal gemstones! This gigantic bracelet has 364 carats total weight of natural quartz crystal gems! These beautiful gems face up eye clean, and they were faceted with checkerboard tops for extra brilliance! They are natural quartz crystal gems, and they are unheated and untreated. The largest gem at the center measures 1.4 inches long, and this amazing centerstone alone weighs 110 carats! The gemstones in this natural quartz crystal jewelry design were faceted from eye clean areas within 100% natural quartz crystals that were mined in Brazil. 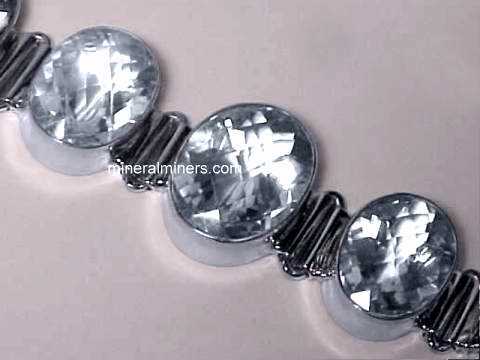 This unique quartz crystal bracelet has open back settings underneath each of the faceted quartz crystal gems. See also a full view of this natural gigantic quartz crystal jewelry design. This genuine quartz crystal pendant was handcrafted in sterling silver and then set with a 12mm round checkerboard faceted gem and a 12x9mm checkerboard pear shape faceted gem of natural rock crystal quartz. These fine quality gems of natural colorless quartz crystal have not been heated or treated in any way! This natural quartz crystal pendant has open back settings so that the gems can touch your skin when worn. This beautiful sterling silver pendant is set with a 10x7mm checkerboard faceted pear shape gem of natural smoky quartz crystal, and with a 12x8mm pear shape faceted gem of natural colorless quartz crystal. These beautiful gems have not been heated or treated in any way. This natural quartz crystal jewelry design is handcrafted in sterling silver. This natural quartz crystal pendant has open back settings so that the gems can touch your skin when worn. 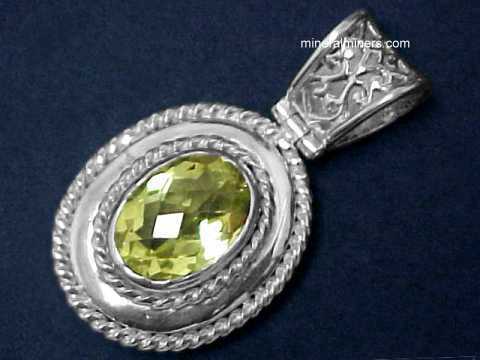 This superior quality sterling silver pendant is set with a fine quality 15x11mm checkerboard faceted pear shape gem of natural smoky quartz crystal weighing 7 carats, and with an 21x14mm oval faceted gem of natural colorless quartz crystal - each with no visible inclusions, and they have not been heated or treated in any way. This natural quartz crystal jewelry design is handcrafted in fine sterling silver. 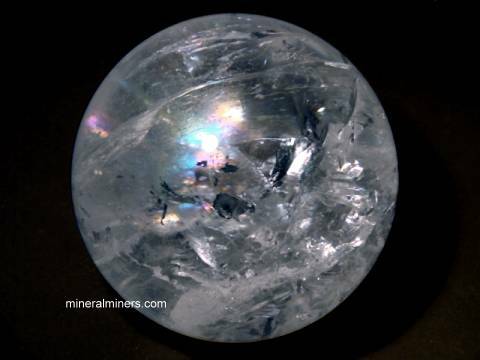 this natural rock crystal faceted gem weighs 21 carats! This extra large size quartz crystal pendant was handcrafted with open back settings under the natural quartz crystal gem, the fresh water pearl, and the mabe pearl. This unique pendant is set with a 21x16mm checkerboard oval faceted gem of natural quartz crystal weighing 21 carats, a 17x7mm fresh water pearl, and a mabe pearl measuring 8mm in diameter. This genuine quartz crystal gemstone is completely clean to the eye with no visible inclusions, and it has not been heated or treated in any way. This natural quartz crystal jewelry design was handcrafted in sterling silver. This natural quartz crystal pendant has an open back setting. It is set with an eye clean checkerboard oval faceted gem of natural quartz crystal weighing 34 carats. 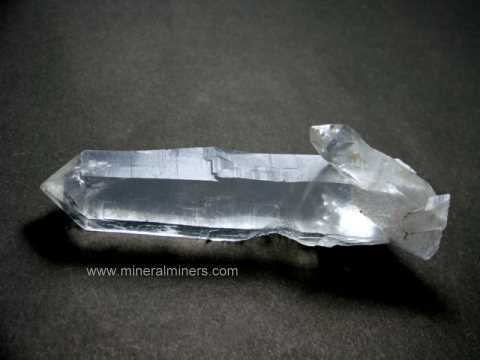 This genuine quartz crystal gemstone is well cut, and it has not been heated or treated in any way. This natural quartz crystal jewelry design is handcrafted in 925 sterling silver. 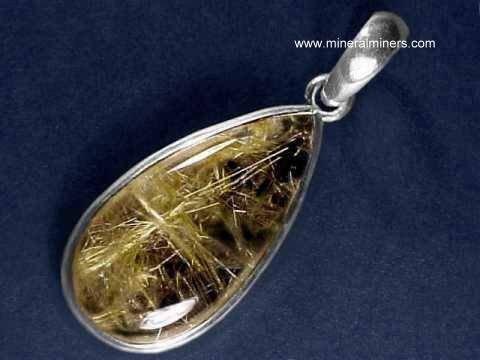 This natural quartz crystal pendant has an open back setting. See also a side view of this large quartz crystal pendant. The natural quartz crystal gem protrudes just slightly below the bezel so that it can touch your skin when worn. 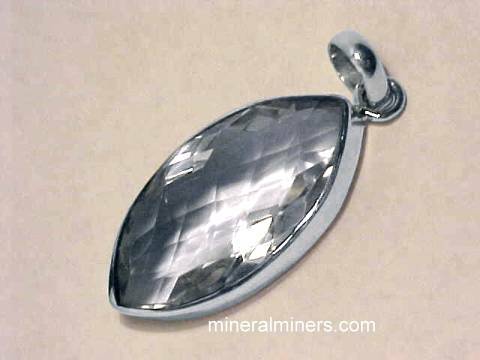 This pendant is set with an eye clean 27x20mm checkerboard oval faceted gem of natural quartz crystal weighing 51 carats. This genuine quartz crystal gemstone has not been heated or treated in any way. This natural quartz crystal jewelry design is handcrafted in 925 sterling silver. This natural rock crystal pendant was handcrafted with an open back setting so that the genuine quartz crystal gem can just touch your skin when worn. 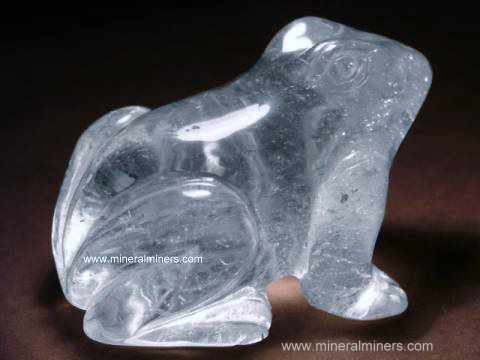 See also a side view of this large rock crystal pendant. 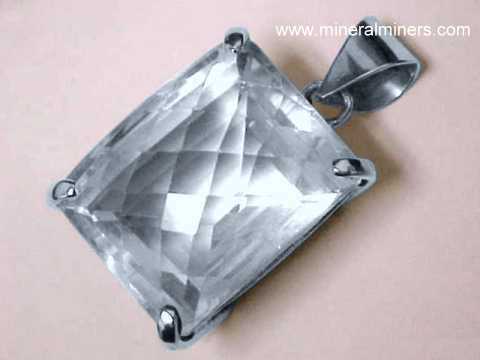 This wonderful pendant is set with a 26mm square cushion faceted gem of natural quartz crystal weighing 68 carats. The back side of this eye clean quartz crystal gemstone has concave faceting which gives the gem amazing brilliance! 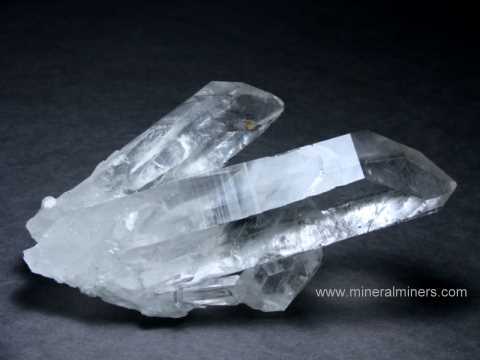 This natural quartz crystal gem has not been heated or treated in any way. This natural quartz crystal jewelry design was handcrafted in 925 sterling silver. This natural rock crystal pendant was handcrafted with an open back setting. See also a side view of this large quartz crystal pendant. 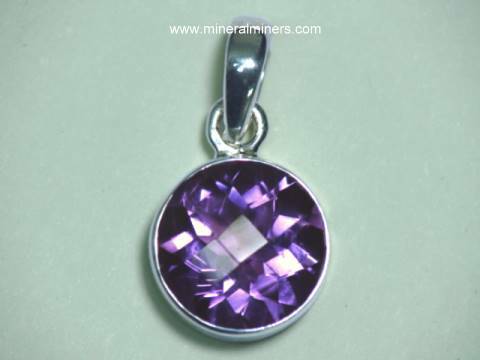 This beautiful pendant is set with a 28mm round checkerboard faceted gem of natural quartz crystal weighing 98 carats. 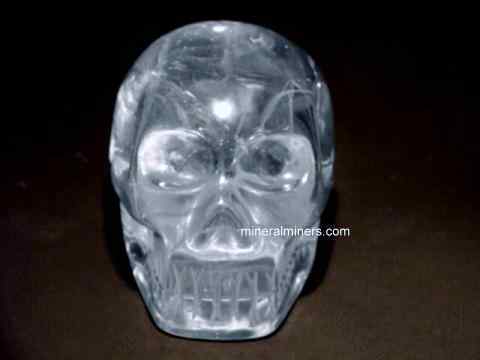 This eye clean quartz crystal gemstone is well cut, and it has not been heated or treated in any way. This natural quartz crystal jewelry design was handcrafted in 925 sterling silver. 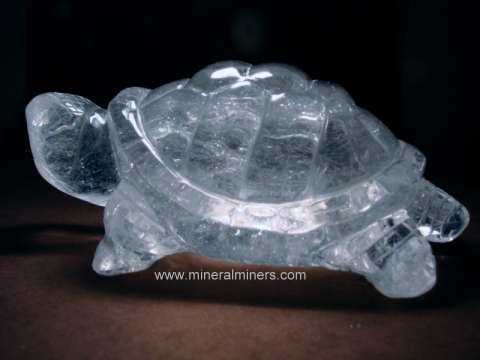 This extra large size natural rock crystal pendant has an open back setting. 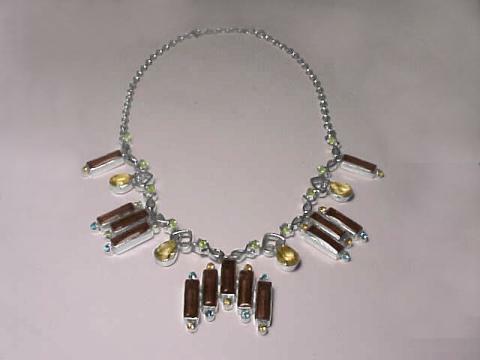 See also a side view of this handcrafted large quartz crystal jewelry design. This natural rock crystal pendant is set with a 34x26mm oval checkerboard faceted gem of genuine quartz crystal weighing 107 carats. 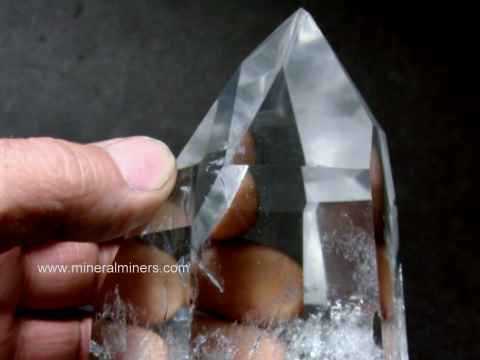 This eye clean quartz crystal gemstone is well cut, and it has not been heated or treated in any way. Genuine rock crystal faceted gem weighs 178 carats! This extra large size quartz crystal pendant has an open back setting and it is set with a 42x30mm checkerboard oval faceted gem of natural quartz crystal weighing 178 carats! This beautiful quartz crystal jewelry design was handcrafted in 925 sterling silver. 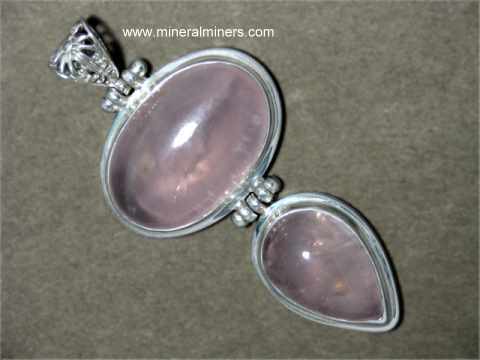 The genuine quartz crystal gemstone has not been heated or treated in any way. The photo at left shows a view from above. See also a side view photo of this natural large quartz crystal jewelry design. 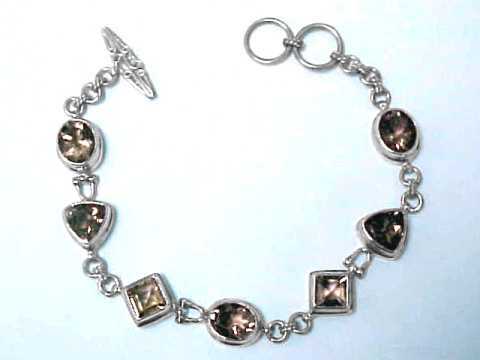 This fine quality quartz crystal bracelet was handcrafted in solid sterling silver and set with seven gradational size faceted gemstones of natural quartz crystal! These beautiful gems were exceptionally well faceted in checkerboard oval cuts with very good brilliance. 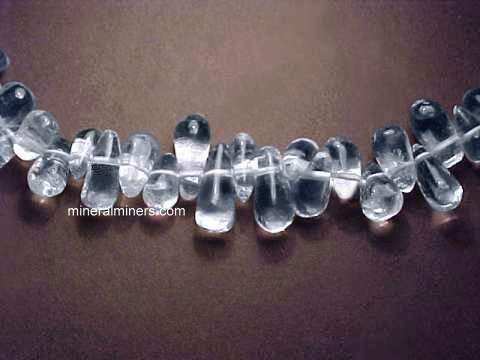 They measure from 14x10mm at each end up to 20x15mm in the center of this fine natural rock crystal bracelet. The photo at left shows a close-up view illuminated by incandescent light, see also a full-view photo of this quartz crystal bracelet. This fine quality quartz crystal necklace was handcrafted in sterling silver and set with nine faceted gemstones of natural quartz crystal. These beautiful gems are crystal clear and they were exceptionally well cut as checkerboard top gems with very good brilliance. They measure from 11x9mm up to 15x15mm in assorted shapes including two ovals, three cushion cuts, three square cushion cuts, and one 15x15mm trillion cut at the bottom! The photo at left shows a close-up view illuminated by incandescent light, see also a full-view photo of this natural quartz crystal necklace. This natural quartz crystal with black onyx necklace was handcrafted in sterling silver and set with eight faceted gemstones of natural quartz crystal, and it also is set with seven checkerboard-top faceted black onyx gemstones! 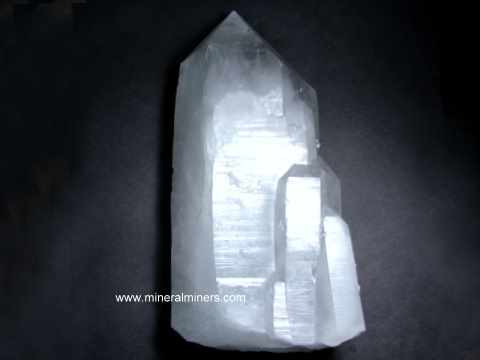 The colorless quartz crystal gems are crystal clear and most are completely eye clean. They measure from 14x10mm up to 16x13mm in assorted shapes. The black onyx gems are well cut as faceted gems and they measure from 9x9mm up to 18x13mm in assorted shapes. The photo at left shows a close-up view. 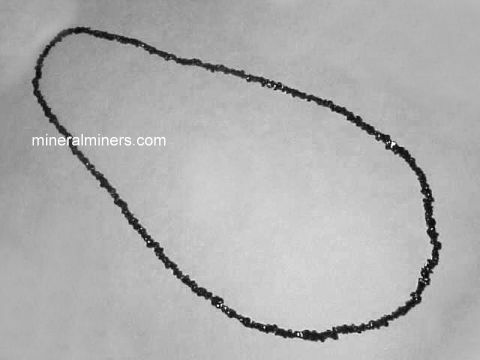 See also a full view of this extra large size rock crystal necklace with black onyx. This unique quartz crystal ring was handcrafted in sterling silver and set with a 16x12mm oval rock crystal cabochon gem with chlorite inclusions. The beautiful "chlorite" inclusions on the back surface of this cabochon gem have a brownish red and purple natural color. The photo at left was taken under incandescent light. This unique quartz crystal ring was handcrafted in sterling silver and set with a 15x12mm oval rock crystal cabochon gem with chlorite inclusions. The beautiful "chlorite" inclusions on the back surface of this cabochon gem have a green with brownish red and purple natural color. The photo at left was taken under incandescent light. This unique quartz crystal ring was handcrafted in sterling silver and set with a 16x11mm oval rock crystal cabochon gem with chlorite inclusions. 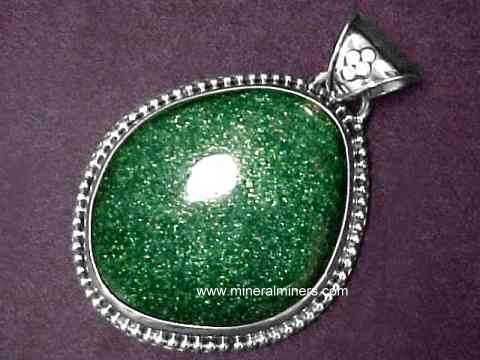 The beautiful "chlorite" inclusions on the back surface of this cabochon gem have a green and purple natural color. The photo at left was taken under incandescent light. This unique quartz crystal pendant was handcrafted in sterling silver and set with a 20x15mm oval shape rock crystal cabochon gem with chlorite inclusions. 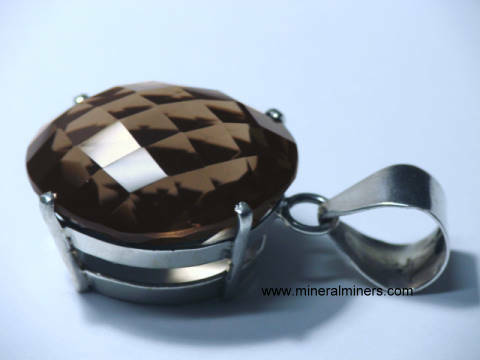 The beautiful "chlorite" inclusions within this cabochon gem have brownish-red natural colors. The photo at left was taken under incandescent light. This unique quartz crystal pendant was handcrafted in sterling silver and set with a 24x17mm oval shape rock crystal cabochon gem with chlorite inclusions. 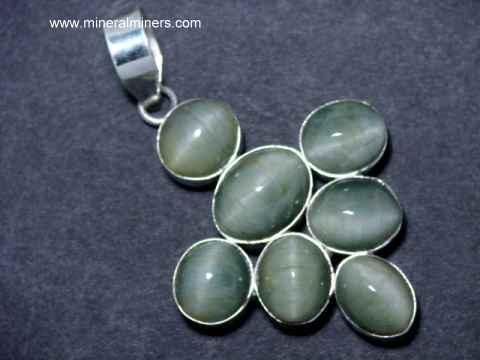 The beautiful "chlorite" inclusions within this cabochon gem have brownish-red natural color. The photo at left was taken under incandescent light. 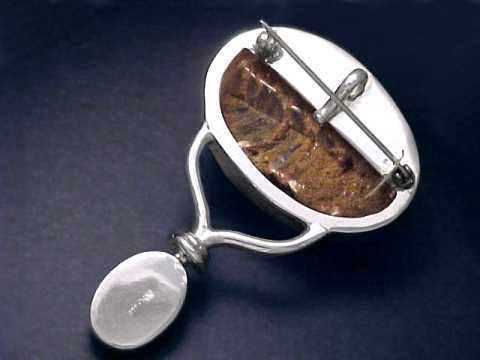 This unique quartz crystal pendant was handcrafted in sterling silver and set with a rock crystal cabochon gem weighing 35 carats with chlorite inclusions. The beautiful "chlorite" inclusions on the back surface of this cabochon gem have orange-brown and purple natural colors. The photo at left was taken under incandescent light. This unique quartz crystal pendant was handcrafted in sterling silver and set with a 26x18mm oval rock crystal cabochon gem with chlorite inclusions. The beautiful "chlorite" inclusions within this cabochon gem have light brownish-red, grayish-purple and green natural colors. The photo at left was taken under incandescent light. 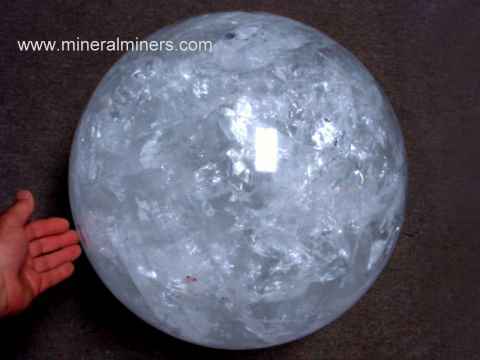 this large rock crystal cabochon gem weighs 120 carats! This quartz crystal pendant was hand-crafted and set with a very large 35x28mm cabochon gem of fine quality natural quartz crystal with beautiful purple and orange-brown "chlorite" clay inclusions! The photo at left was taken under incandescent light. 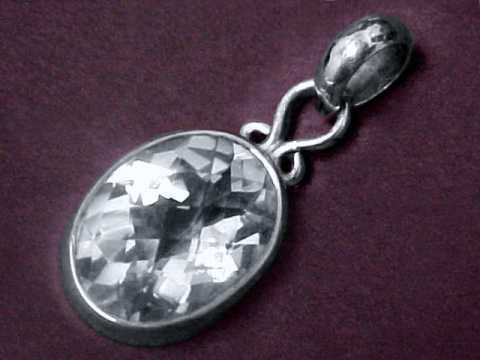 This beautiful quartz crystal jewelry pendant was handcrafted in sterling silver. This very large rock crystal pendant was hand-crafted and set with two cabochon gems of natural rock crystal quartz containing natural multi-color "chlorite" inclusions. 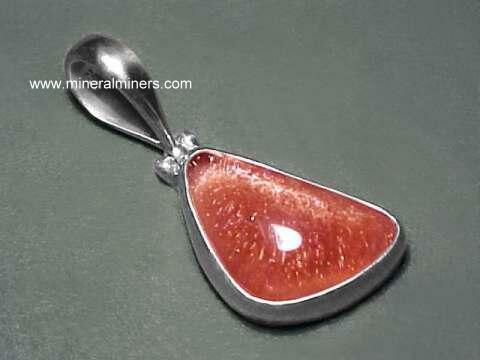 Just the larger cabochon alone in this sterling silver pendant weighs 185 carats! 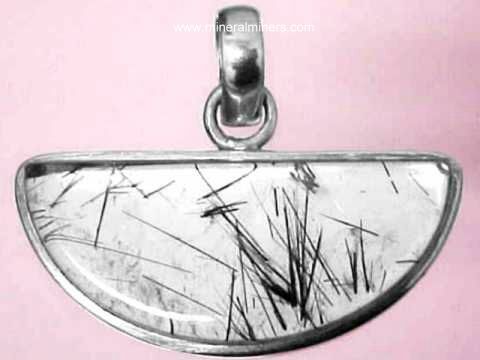 This unique quartz crystal jewelry pendant has a bar clasp on the back so that it can also be worn as a brooch, see a back-side view photo. The photo at left was taken under incandescent light. Natural rock crystal (genuine quartz crystal) pieces mined in Brazil with superior transparency were tumbled and polished in baroque shapes, and then drilled and strung in this beautiful 36" (90cm) "endless" rock crystal necklace. There are approximately 300 drilled baroque shaped beads in each of these fine quality quartz crystal necklaces. 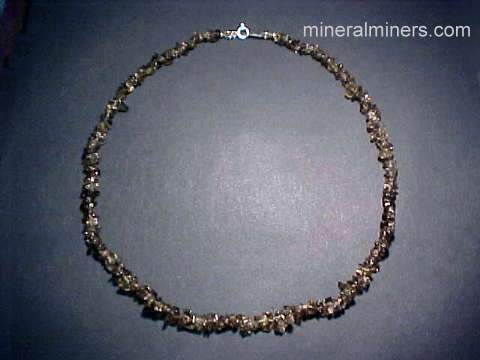 The photo at left shows a close-up view of this natural rock crystal necklace. 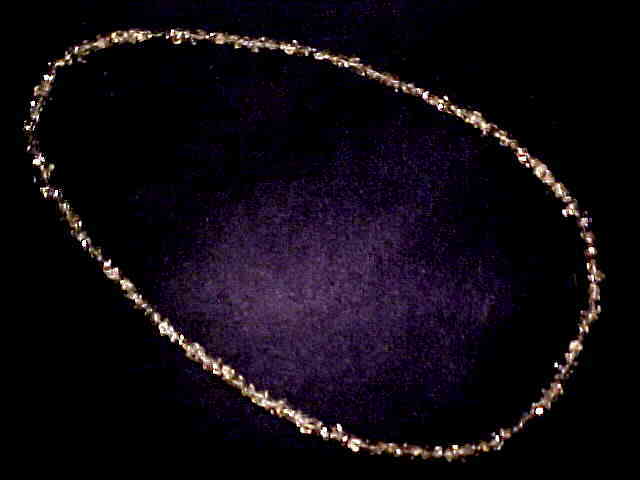 See also a full view photo of this genuine quartz crystal necklace. These natural quartz crystal necklaces make great gifts! 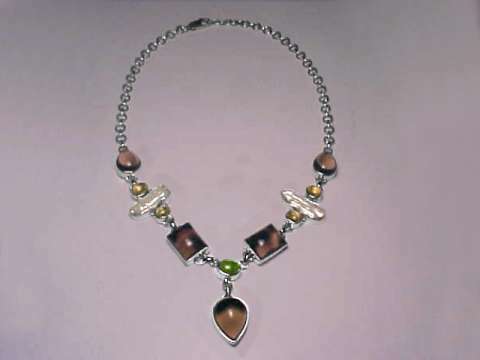 We also have baroque bead necklaces on the following pages amethyst jewelry, apatite jewelry, aventurine jewelry, carnelian jewelry, citrine jewelry, red garnet jewelry, and our labradorite jewelry page. 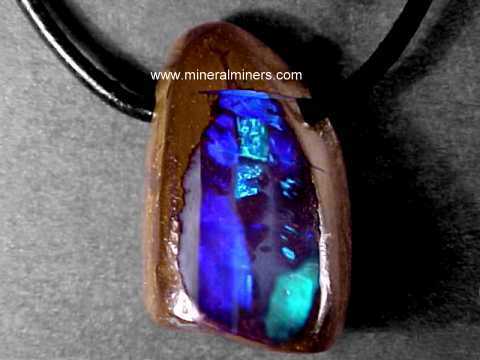 See also our pages with lapis lazuli jewelry, moonstone jewelry, peridot jewelry, rose quartz jewelry, smoky quartz jewelry, tanzanite jewelry and tourmaline jewelry. 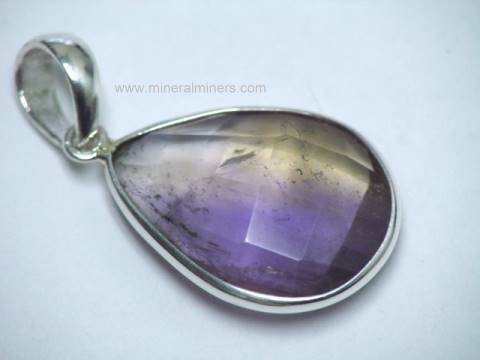 This unique quartz crystal pendant was hand-crafted in sterling silver and set with a large cabochon gem weighing 104 carats of natural rock crystal quartz with beautiful purple and green chlorite inclusions! This large quartz crystal ring is a ring size 8. It is set with an 18mm round faceted gem of natural quartz crystal with very brilliant concave cutting. 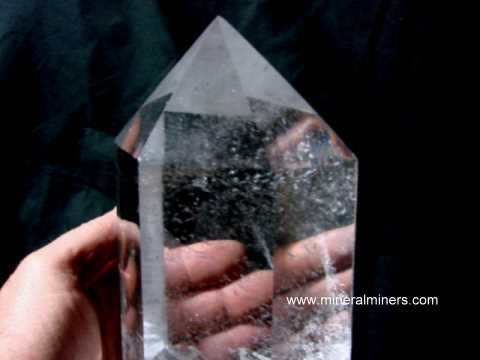 This superior quality quartz crystal gemstone has not been heated or treated in any way. This natural quartz crystal jewelry design is handcrafted in 925 sterling silver. The photo at left shows a top view. See a front view photo of this natural quartz crystal ring. See also a side view photo of this genuine quartz crystal ring design. This large quartz crystal ring is a ring size 7 1/2. It is set with a 23x17mm oval faceted gem of natural quartz crystal with very brilliant concave cutting! 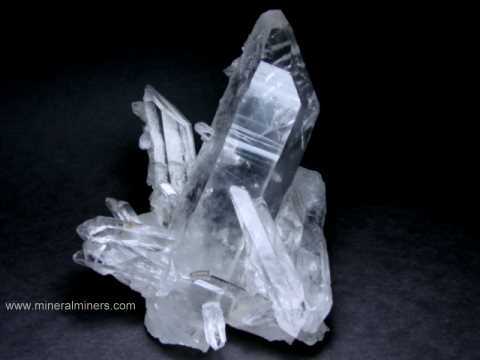 This superior quality quartz crystal gemstone has not been heated or treated in any way. This natural quartz crystal jewelry design is handcrafted in 925 sterling silver. The photo at left shows a side view. See also a top view photo of this natural quartz crystal ring. This beautiful quartz crystal ring is a ring size 7. 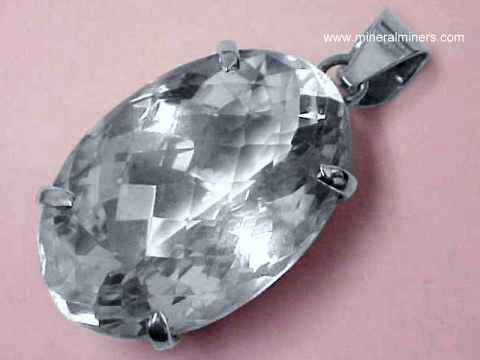 It is set with a 25x18mm oval faceted gem of natural quartz crystal weighing 36 carats! 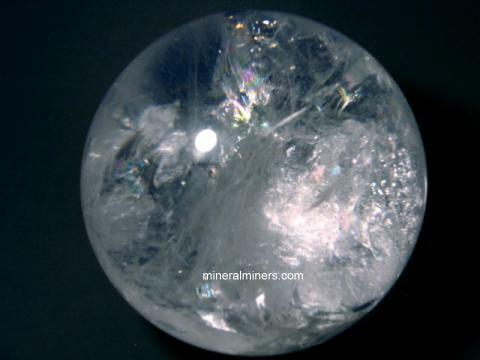 This superior quality quartz crystal gemstone has not been heated or treated in any way. This natural quartz crystal jewelry design is handcrafted in 925 sterling silver. The photo at left shows a view from above. See also a side view photo of this natural quartz crystal jewelry design. 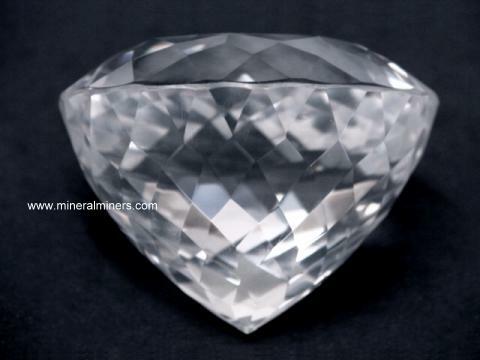 This natural rock crystal faceted gem weighs 54 carats! This extra large size quartz crystal ring is set with a 26x23mm rectangular shaped checkerboard faceted gem of natural quartz crystal weighing 54 carats! 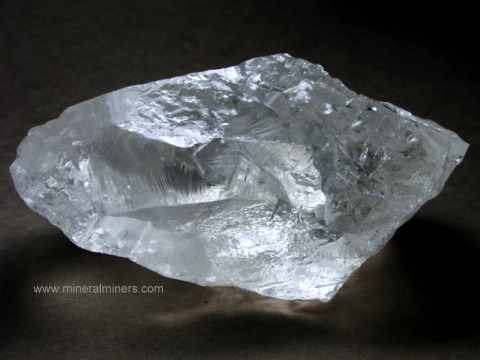 This superior quality quartz crystal gemstone is completely clean to the eye with no visible inclusions, and it has not been heated or treated in any way. This natural quartz crystal jewelry design is handcrafted in 925 sterling silver. The photo at left shows a view from above. See also a side view photo of this natural large quartz crystal ring design. Our Rock Crystal Jewelry is all 100% Natural Quartz Crystal Jewelry! We have a very large selection of natural quartz crystal jewelry designs, every one set with genuine quartz crystal gemstones that are unheated and untreated. 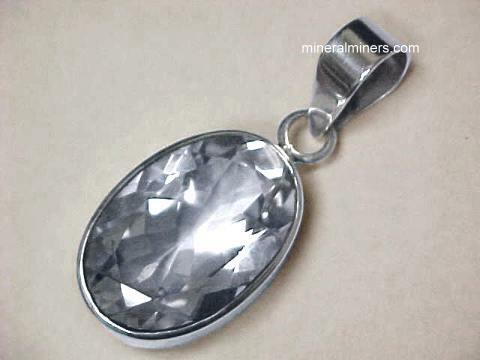 We offer a variety of shapes, styles and sizes in genuine rock crystal quartz jewelry in unique quartz crystal pendants, quartz crystal bracelets, and quartz crystal necklaces, each one handcrafted and set in pure 925 sterling silver rock crystal quartz jewelry designs. Each one of our quartz crystal jewelry items is set with natural quartz crystal gemstones! We have quartz crystal jewelry items available with cabochon gems of natural quartz crystal (natural rock crystal cabochons), and we also have faceted gemstone jewelry items set with natural quartz crystal gems. We have a large selection of beautiful quartz crystal jewelry designs set in pure sterling silver including quartz crystal necklaces, quartz crystal bracelets, and quartz crystal pendants - each one hand crafted and set in sterling silver with gemstones polished from natural quartz crystals that were mined in Brazil. See also our other varieties of natural quartz including smoky quartz jewelry, our natural rock crystal quartz gemstones, and our natural crystal balls and natural quartz crystals. See our selection of genuine phantom quartz crystals. We have all of the natural quartz varieties set into handcrafted jewelry designs in pendants, earrings, necklaces, rings, and bracelets. 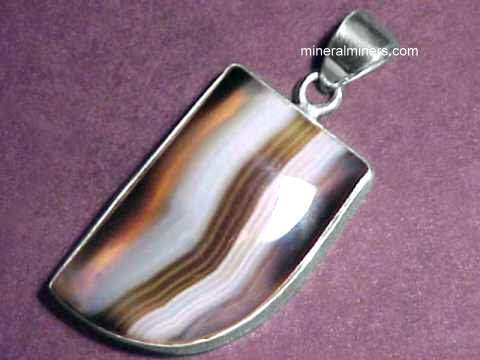 See a list of all our genuine gemstone jewelry varieties! 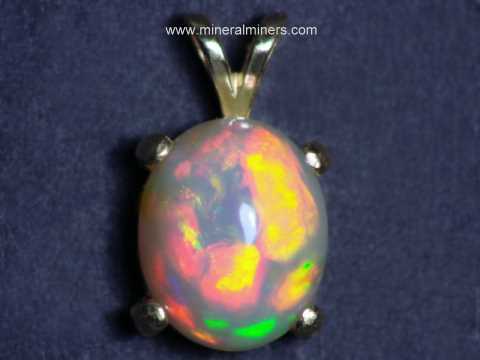 Some of the natural quartz varieties are very well known by their own varietal name such as opal and agate. Most people are unaware that these are actually varieties of the mineral quartz! Would you like us to inform you when we add on this page more natural quartz crystal jewelry pendants, natural rock crystal bracelets, and natural quartz crystal necklaces, all set in pure 925 sterling silver? We have additional inventory of natural quartz crystal jewelry items in stock, so be sure to let us know if you have any natural rock crystal jewelry special requests. Please contact our webmaster, regarding genuine quartz crystal jewelry or our 'site' geologist with any questions or comments.